I love a good challenge, especially when food is involved. This month, I was challenged to come up with a recipe or fun way to use Libby’s NEW Vegetable Cups, and I have to admit….I surprised even myself. 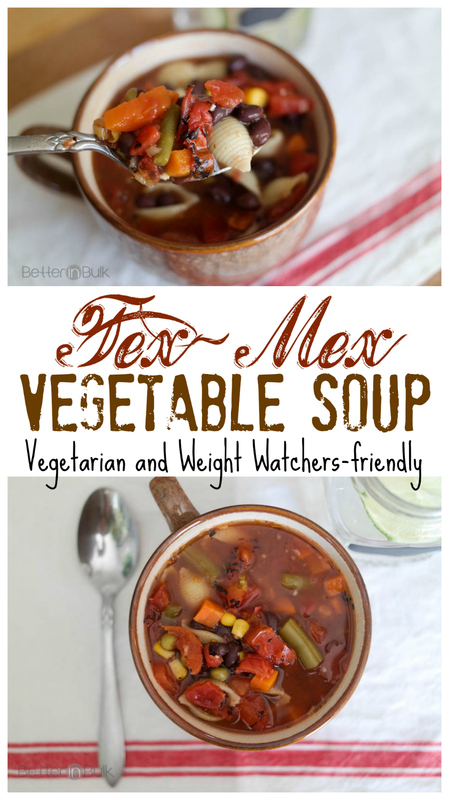 My whole family couldn’t get enough of the Tex-Mex Vegetable Soup that I made! Although this post (and the giveaway that follows) have been sponsored by Libby’s, all thoughts, opinions, and recipe are my own. This past weekend, we were hit by a pretty hefty snow storm, which meant that it was the perfect setting for some warm, comforting soup. But it also meant that we couldn’t get out to the grocery store to do a weekend shopping trip (I tried heading out once on Saturday and turned around as soon as I got out of the neighborhood because the roads were so bad!). So as I was contemplating what I could make for dinner on Sunday, I gave myself an added challenge to use all canned or dried foods. When I mentioned my plan to my husband, I’ll be honest with you. He was not excited. He’s all about fresh and homemade, and when I said “canned” he immediately turned his nose up. Guess what? This SOUP changed his mind. I’ve made soups before using canned vegetables, but the challenge with full-sized cans is that you can only fit so much variety in the pot before you’re over-flowing. 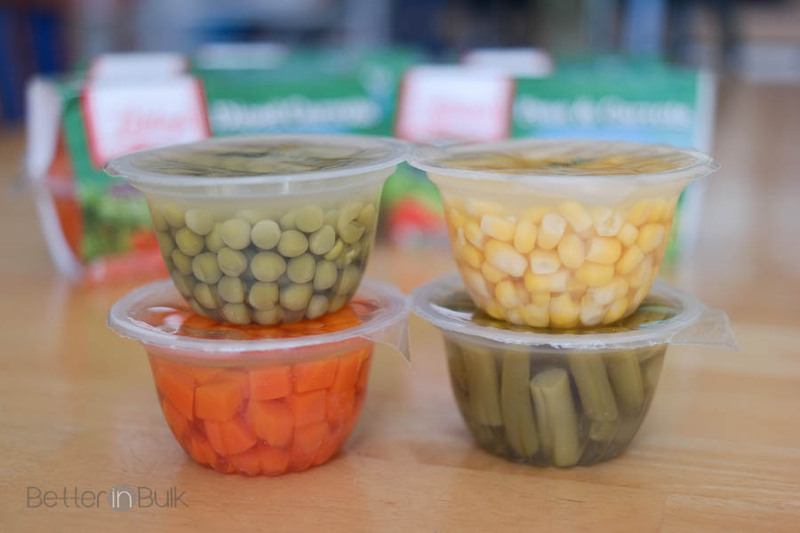 With Libby’s 4-ounce vegetable cups, I was able to add 4 different kinds of veggies – corn, peas, green beans, and carrots – to the soup and had just the right amount to feed all 6 of us for dinner. Yes, the family is all eager to have this vegetable soup again and again. By the way, each one of my kids, including my rather-picky 9-year-old, had multiple servings of soup…until the whole pot was gone. And we’re talking vegetables here…not chicken nuggets and fries! By the way, I plugged the recipe into my Weight Watchers recipe builder and was pleased that it came in at a low 4 PointsPlus per serving. Of course, if you add anything extra to the soup, like tortilla chips or shredded cheese, that number will increase slightly. 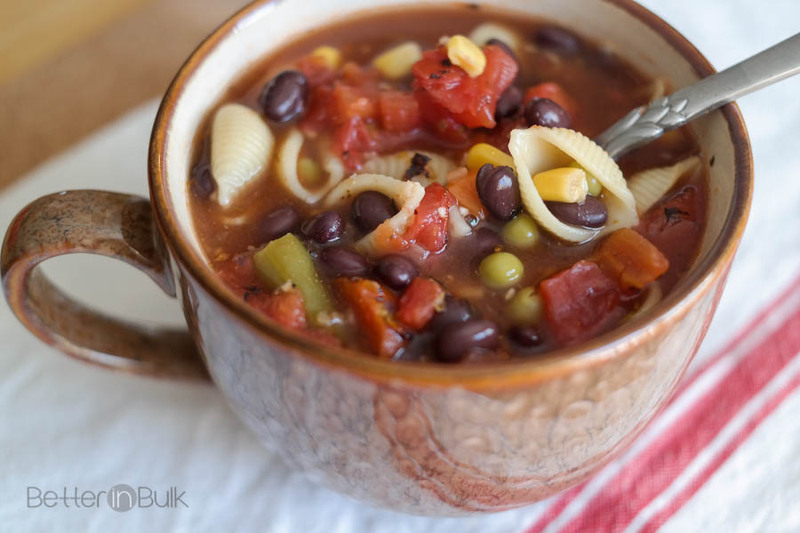 This soup comes together in just 15 minutes for a quick and satisfying dinner, but the flavors improve with time! If you have extra time, I recommend simmering the soup for an hour before serving. Add water to medium pot; bring to boil. Add remaining ingredients. Note: you can either drain the vegetable cups or just dump the whole cup plus liquid into the soup. Heat on medium-high until heated through. When soup starts to get bubbly, you can turn the heat down to simmer for 30-60 minutes or you can serve right away. Remove bay leaf before serving. Optional toppings: shredded cheese, crushed tortilla chips, sour cream, fresh cilantro, etc. Libby’s Vegetable Cups are conveniently portioned in single-serve and easy-to-open packaging making then perfect additions to lunchboxes for time-crunched families, but they’re also great to use in side dishes, main courses and even appetizers. They are perfect for portion control, eliminating waste and quick, healthy servings of your favorite vegetables. The Cups are pre-cooked and can be served cold or warm, whatever you prefer! By the way, Libby’s also has single-serve fruit cups as well, which my kids love to bring in their school lunches. Get more information on Libby’s products, including the Vegetable Cups, HERE. I’m excited to be giving away a Libby’s prize pack which includes Pyrex 14-Piece Glass Food Storage Set with Lids, a $75 gift card, as well as an assortment of Libby’s® Vegetable Cups. This giveaway will run through 11:59 PM ET March 9, after which a winner will be chosen at random and notified via email. Enter on the form below. Great Idea using mini veggies!! Thanks for linking up to Merry Monday! Sharing on our Mm Pinterest Board! Have a great week! This looks delicious and perfect for a chilly day! These would be great for vegetable lasagna! I would use them to make soup. I would use them for soup! I love veggie soup. I would make a chicken pie. I would make a chicken stir fry with the vegetables. Would be great to have as a couple of sides with dinner. I would use Libby’s Vegetable Cups in my kitchen for soups and chilis. I might use the vegetables to make a soup. I’d also add these veggies to a hot beef sandwich. I would use these as a side to go along with dinner. I would use them to take fresh fruit to work with me and to portion my rice and sides at dinner. I would use them as a side dish when I serve fish or chicken. They would be great to add bulk to casseroles. I would use Libby’s Vegetable Cups to put on my lunch salads to take to work. I use these veggies all the time in Italian Sausage soup. I can’t wait to try your recipe. They also work great in pasta salads or casseroles. I would make a chicken pot pie with all the different vegetables. I would use Libby’s Vegetable Cups in my kitchen for homemade soup. I would use the veggies to make vegetable chicken soup. I am going to use the Sweet Peas in my Pasta Carbonera recipe! I’d add these veggies to my Mexican surprise. I Would Use Libby’s Vegetable Cups To Make Mini Chicken Pot Pies. I would do individual dinner servings because each grand kid likes different vegetables. I would love to use these veggies to make some veggie soup! Yummo!! This veggie cups would be good to use in making fried rice. I would stock my Dad’s pantry with these cups. He’s on a special diet so I cook and freeze meals for him, but he rarely will heat up any veggies to go with because he doesn’t like having to store the leftovers. Problem solved! Would be great for a veggie only dinner. I would use them as sides with dinner. I would use Libby’s Vegetable Cups to make jambalaya. I want to use the Sweet Corn to make my Sweet Corn Pudding! These veggies would be perfect for quick meals on the go! i would use them to make a chicken and dumplings! The green bean veggie cups would be perfect to use as a snack for my grandson, he loves green beans! I would use the for a chicken pie. These veggies would be good added to my spaghetti sauce. We need some warm soup in this cold weather too! And it’s always good to have a “pantry item” recipe you can make when needed. :) I hope you can stop on by and share this or any other recipe with us on Five Friday Finds! They would be great for Veggie Soup! I would love to add these veggies to my chicken and dumplings! Yummo!! I would use Libby’s Vegetable Cups in soups and chili. I would use these to make soup! I am going to use the green beans to make my green bean casserole for Easter! I would use the carrots for a stew. These would be good for making beef stew. I’d add these veggies to a pasta salad. I would use in soups, and pasta salads. I would use the green beans in a tuna casserole. These would be great for quick meals and sides to please everyone! These make such a great thing to have when I am making a meal for one. I would use Libby’s Vegetable Cups in my kitchen for jambalya. I would like to make my Pot roast with the carrots! I would love to add the corn to my home made chili. I’d add the Veggie cups to a veggie salad. I would use them in my chicken veggie soup! I would use them in my husband’s lunches. Another place I’d add these veggies is to omelettes. I would love to use these to make chicken pot pie! Four points per serving?! That’s amazing! The soup looks delicious. I wished you’d come here and cook for us — we’re in Italy. Are you tempted?! hahaha! Thank you so much for sharing this delicious and simple recipe on Inspire Me Mondays. See you next week! I’m VERY tempted! I’ve always wanted to travel to Italy. :) And yes…I was amazed at how healthy it turned out, since it really is mostly veggies! I would use the peas and carrots to put in my Slow Cooker Beef Stew! Would love to make some soup with these veggies!! The peas would work great to add to tuna noodle casserole. Sometimes I add the veggies to my smoothies for a nutritional boost. I would use the Peas and Carrots in my Shepard’s Pie recipe that I make every Easter! I am freezing today! I wish I had some of these Libby’s veggies to make some quick Veggie Soup! I would love to make these Libby’s veggies to make some veggie soup! Quick and easy! I buy these easy cups all the time for my Elderly father! They are so easy to use now that I can heat them up in the microwave! My Dad likes the carrots with Honey and Cinnamon on top! These veggies would be good added to a Shepherd’s pie. These would be great to use as a side with meals. I would use them in Shepard’s Pie as well as in stew and other casseroles. So glad to see these. I am going to encourage my widowed father to eat these. I’m also going to incorporate them into my kids meals. That small portion size is very do-able to ask them to eat. I’d add the veggies to soups and stews. I would make chicken pot pie. I would use these cups for different side dishes and snacks. These would be great to use in a chicken pot pie. I would love to make some quick chicken pot with these veggies! I would use them for a crock pot chicken vegetable stew. I’d use Libby’s Vegetable Cups in recipes that call for canned or frozen vegetables like chili, jambalaya, and soup. I would use them in a yummy chicken pot pie! This would be a great way to sneak more veggies into my day! I would love to take these veggies to work with me for lunch! the would be great to use to make my Shepard’s Pie. I would use these vegetable cups for soup making or for sides when every one doesn’t want the same veggie with dinner. 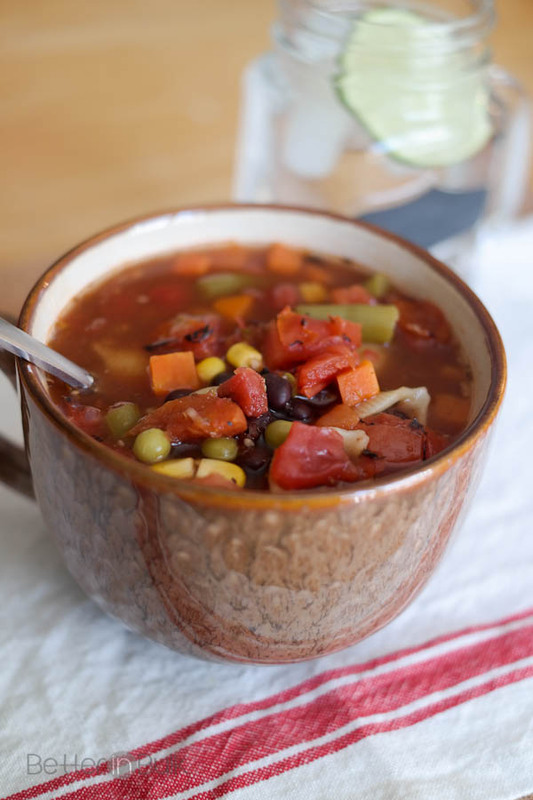 The more I look at your veggie soup, the more I want to try it! 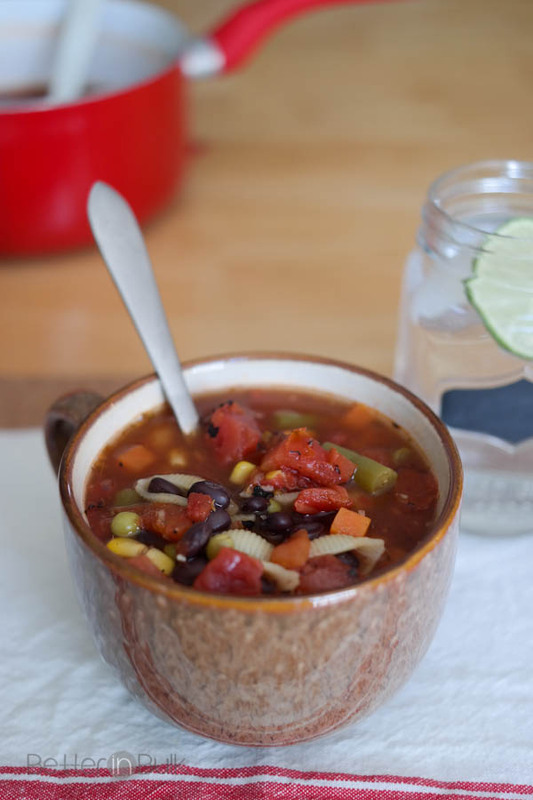 I would love to use Libby’s veggies to make this soup! I’d would use Libby’s Vegetable Cups for quick sides. I would use Libby’s Vegetable Cups for vegetable soup. I’d use them to make a stew! I would love to make the above veggie soup with the Libby veggies! It looks so good! These would be perfect to make quick lunches for the kids, especially veggie soup! I would use the vegetable cups to add some crunch and flavor to lasagna! I’d use Libby’s Vegetable Cups for quick soup recipes. Yum, that soup looks so yummy and perfect for this cold weather that we are getting right now. I would totally make this recipe, thanks for sharing! I can’t wait to try the Simple Apple Smoothie from your An Apple a Day – A Collection of Apple Recipes! 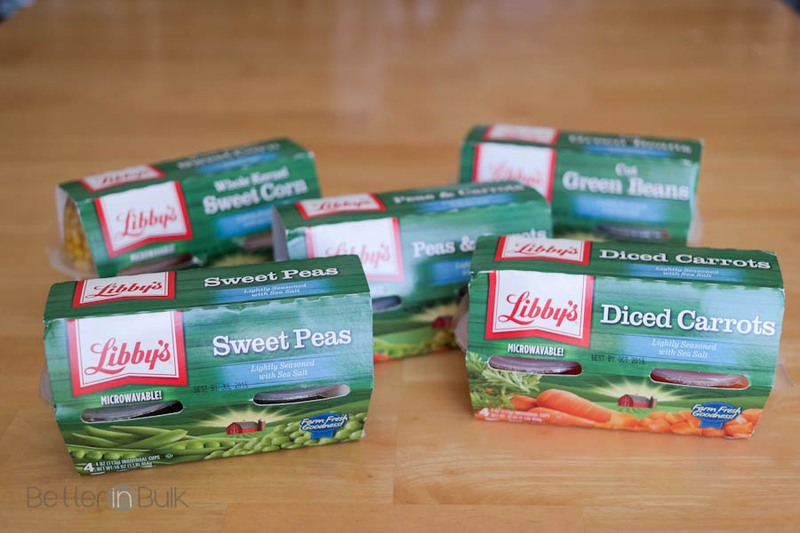 I would love to use these Libby’s veggies to make quick chicken pot pie and a quick veggie soup! These will make all of my soup making so much easier and quicker… I’m also going to try them in chili!! I would use the vegetable cups in recipes, and as healthy snacks. Yes, I love to snack on veggies! I would definitely use them in the soup you made …it looks delicious! I would use these in everything, right now I have a thing about adding veggies to my pasta sauce for more nutrition. These would go well with that and so many more dishes. Would love to use these in different side dishes! Or I would bring them with me to eat on the go. I would grab a variety of them to take w/ me on vacation to make an easy meal like chicken pot pie. These would be perfect for me, since I’m the only one here. I like that I wouldn’t have to re-reheat canned leftovers, when I could just pop open a fresh cup each time. I would either use the veggies in a soup like you did or in a pot pie! That sounds yummy!